Albert Jake Lapis Lazuli Graduated Row Bracelet size 6 3/8"
This rich five-stone row bracelet of natural lapis lazuli is set with thick, graduated ovals of deep blue stone flecked with iron pyrite. Raindrops and appliquées set between the stones add dazzle to the design. Traditional stampwork decorates this scalloped-edge bracelet to the terminals. You'll love the heft of this carat-rich bracelet. Hallmarked A JAKE and stamped Sterling inside the cuff. 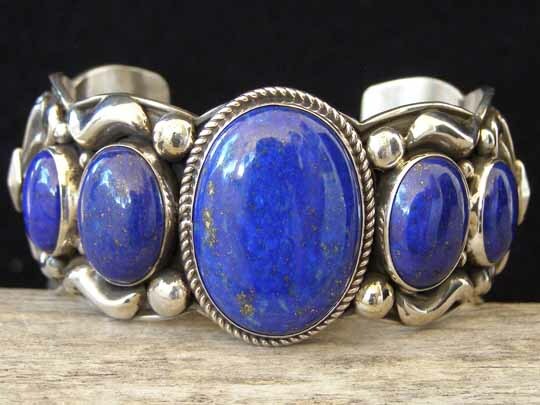 Lapis lazuli: center 1 3/16" x 7/8"; 2 ovals 3/4" x 9/16" & 2 ovals 9/16" x 3/8"
Width of cuff: 1 3/16"